Getting a college education is an expensive process. The costs of going to school add up quickly, and for many people, even though getting a college degree does eventually pay off, it may take a few years of working before they finally land a G.O.O.D. (get-out-of-debt) job with a livable salary. In order to deal with all the costs associated with going to college, many students need to borrow extra money to help cover living expenses and that makes it even more difficult for them to repay their loans after they graduate. Although lenders explicitly advise against borrowing more than you need, the fact of the matter is that many students do it because they have to. There are other items such as clothes, personal grooming items, as well as transportation costs that could easily be added to the list as well. In general, but not always, students typically spend the first two years of college either living at home or on campus and find their own accommodations during their final couple of years. Gaining independence is a wonderful thing, but it also comes with higher living expenses. Federal student loans are typically handled through Sallie Mae’s Department of Education Loan Services. One of the biggest forms of aid that Salle Mae offers students is that their loan payments are deferred until six months after they graduate provided that they are enrolled at least half time, typically six credit hours per semester, for at least two semesters of the school year. As long as you stay enrolled for a period of less than six months, you don’t have to make student loan payments. However, students who take more time off and then re-enroll may have to file a new in-school deferment form. One problem with student loan deferment, though, is that some students abuse it to the point of ending up in worse financial trouble. For example, a student who receives an undergraduate degree and then decides to enroll in graduate school simply because he or she cannot afford to start paying back his or her students is only asking for trouble. 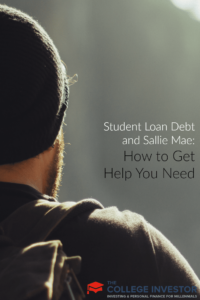 Rather than taking on more debt for a graduate degree that you may not really need or ever have use for, you are better off speaking with a Sallie Mae representative about other possible debt-relief options. If you reach a point where you no longer qualify for deferment, but you need help managing your loans, you can apply for voluntary forbearance. A good point to keep in mind is that forbearance actually adds to the cost of your loan because you are responsible for the interest that accrues on the loan. Before you go this route, you should consider whether or not you are eligible for any types of deferment such as military service, disability, or parental leave. Although forbearance can be a great temporary relief to graduates who are struggling to reply their student loans, they should speak with a Sallie Mae representative to see if they qualify for other options first. Forbearance is typically a last resort measure. Sallie Mae has a wide variety of programs that may actually help reduce the cost of your loan debt, or at least not increase it, that you should ask about before applying for forbearance. We have a great resource that explains ways to get student loan forgiveness. Most college students take out several different loans, all with different interest rates and repayment terms. Stafford Loans, Perkins Loans, PLUS Loans, and subsidized and unsubsidized Federal loans are all different. After graduation, you should use a good student loan calculator to figure out what your exact repayment terms will be for all of your loans. Figuring out what your repayment terms are in advance will give you a good idea of whether or not you can afford the monthly payments and give you a chance to contact your lenders in advance if need be. If it is at all possible, you should try not to take advantage of in-school deferment. You may think that is impossible given that you’re already struggling to make ends meet, but even just paying $20 per month while you are in school will help lower the principle and interest that you have to repay after you graduate. Instead of letting interest accrue on your loans for four or more years, consider making small payments while you are still enrolled in classes. Every little bit helps. When you are ready to graduate, Sallie Mae provides excellent resources for figuring out how to repay your student loans. As a final note of caution, the worst thing you can do is give up at the sight of your potentially massive student loan debt and just ignore it. The fact of the matter is that it isn’t going to go away. If you stay in touch with your lender during difficult times, then the lending companies will most likely work with you to come up with some kind of feasible repayment plan or compromise. However, if you just flat out ignore your debt, then the lender has every reason to believe that you intend to default on it. Rather than bury your head in the sand, be proactive and don’t be afraid to contact Salle Mae or any of your other lenders. You will likely be surprised at just how much they are willing to help you if you show an interest in repaying your debt. If you’re struggling with Sallie Mae and are looking for help, start by contacting them. As crazy as that sounds, starting with their customer service is a solid starting point. If you’re not quite sure where to start or what to do, consider hiring a CFA or CFP to help you with your student loans. We recommend The Student Loan Planner to help you put together a solid financial plan for your student loan debt. Check out The Student Loan Planner here. Finally, if you are able to, you should look at refinancing or consolidating student loans with a lender other than FedLoan Servicing. You can do this in a variety of ways, but I would recommend starting with Credible. Credible is a “Kayak for student loans,” meaning you fill out one simple form and receive offers from multiple lenders on a single dashboard. Credible only works with high quality private lenders, who will be a lot easier for you to work with than FedLoan. Did you use any programs to help you get out of student loan debt? People ignoring their debt is one of the biggest problems that i see. There are a variety of repayment plans and options available and though it can be difficult and complicated at times, anyone can do it. It is almost like a cancer. Its no fun to deal with, but with each day that passes, the situation gets worse. I imagine everyone has plans of repaying their student loans quickly and then life interferes with all your plans. Little things like finding a job or a job that pays well enough to repay the loans. Hopefully, it is temporary and eventually work out. The important part is to understand your choices and the consequences. Good explanation.